If anyone could rightfully claim to be the father of Beverly Hills, it was Burton E. Green, the oil millionaire who drilled his first productive well near the Los Angeles Civic Center in 1901, and who soon owned hugely profitable oil fields throughout Los Angeles and Kern Counties. As president of the Rodeo Land & Water Company, he supervised the grand opening of Beverly Hills on October 22, 1906, and overcame slow lot sales following the Panic of 1907 recession. Of critical importance, Green listened to skilled Realtor Percy Clark’s inspired advice to transform the Hammel & Denker Ranch (where Green and his partners had failed to find oil) from acres of dusty bean fields into a fashionable community of large homes on gently curving, tree-lined streets. (See introduction to Beverly Hills; page 9.) Green also hired, at Clark’s suggestion, landscape architect Wilbur D. Cook and architect Myron Hunt to prepare the master plan and other design guidelines for the new community. Shortly after the Beverly Hills Hotel opened in 1912—and it had been built with a loan from the Rodeo Land & Water Company—Green made an unmistakable show of confidence in Beverly Hills’s future: He started construction on his own showplace estate several blocks north of the hotel. Furthermore, he encouraged his well-to-do business associates and friends to build estates nearby. In the summer of 1914, Green moved into his newly completed Beverly Hills home with his wife, Lilian, and their three daughters: Dorothy, who was known as Dolly; Liliore, whose name was a variation of her mother’s; and Burton, who was named after her father. Green purchased an eleven-acre parcel on the north side of Lexington Road that stretched a full block, from Hartford Way and Cove Way on the west and north, to North Crescent Drive on the east. Situated on a small knoll, and with the land to the south still empty and treeless, Green’s property commanded a panoramic view from downtown Los Angeles to Santa Monica Bay. The only immediate neighbors were Henry and Virginia Robinson, whose estate stood on Elden Way, north of Lexington Road (see page 58). The Green mansion was vaguely Tudor—or what one observer described as “a broad treatment of the English domestic style”—and it would have fit in perfectly with the other in-town mansions along then-fashionable West Adams Boulevard—but it did not reflect the era’s finest architectural aspirations. developers later responsible for Holmby Hills and Westwood. Haenke even designed the imposing gates at Fremont Place’s entrances. Whatever the Green mansion lacked in architectural sophistication, it compensated for with large rooms and myriad comforts. The front door opened into a 25-by-30-foot reception hall, which led into the 20-by-30-foot staircase. The first floor boasted a 24-by-45-foot living room, a 20-by-24-foot library, a 24-by-35-foot dining room, an adjacent breakfast room, a butler’s pantry, and kitchen. The living room, dining room, and library, as well as the entrance hall and staircase hall, were richly paneled in mahogany, walnut, and oak. Every main room had a marble fireplace. The east and south-facing rooms opened onto 24-footwide terraces overlooking the estate grounds. On the second floor, the five bedrooms were finished in white enameled woodwork, and each bedroom had its own dressing room and full bath. The second floor also included a nursery and sleeping porch. Servants’ quarters were located under the steeply sloped slate-paved roof. The grounds, of course, were another testament to Green’s success, and they were the features that distinguished a true estate from merely a large home. The recreational features included the required tennis court, a playground for his children, a small lake, and various garden pavilions. There was no swimming pool or “plunge”: that feature did not become a “must have” until the 1920s. From this grand estate, Green guided the development of Beverly Hills, particularly after some of his Rodeo Land & Water Company partners, such as Charles A. Canfield and Max Whittier, focused on other investments, or had passed away. Yet Green never launched another great real estate development. He was, first and foremost, an oil man, and he devoted most of his time to those lucrative ventures. in the realm of those known disparagingly as “movie people.” He was a founding member of the very proper California Club and the Los Angeles Country Club locally, in addition to the Pacific Union Club and the Bohemian Club in San Francisco, and the Metropolitan Club in New York. What did Green think of the influx of Hollywood movie stars, producers, and directors into Beverly Hills in the 1920s and 1930s? After all, these self-made, self-created men and women—and particularly rough-and-tumble producers such as Jack Warner and Joseph M. Schenck—were never welcomed into Green’s social clubs. Did he view the newcomers with disdain? Or, just perhaps, with a guilty pleasure, knowing that their presence increased the value of Beverly Hills real estate? We will never know. In 1965, Green died at his Lexington Road estate at age ninety-six. He had outlived all of his contemporaries. He had seen hundreds of houses constructed in Beverly Hills. And he lived long enough to have witnessed some of the great estates along Lexington Road and in Benedict Canyon fall to the subdividers and their bulldozers. He had known for decades that his vision, and that of his Rodeo Land & Water Company partners, of Beverly Hills as one of California’s greatest and best-known communities had come true. Green estate. He remodeled the house. Completely. Klein changed the façade from vaguely Tudor to vaguely Georgian. He ripped out one second-story bedroom, so that the living room ceiling could be raised to a height of twenty-two feet. He removed the staircase hallway paneling, but he re-used some of the wood for the bar in his barroom. It has been completely renovated once again, and the residence now achieves the dignity and quality of a famed Beverly Hills estate. In Beverly Hills’ early decades, the estate owners’ great fortunes usually came from oil, real estate development, or motion pictures. But there were a few high-profile exceptions, one of whom was Nebraska-born Oscar B. English, who made his millions in gypsum, an essential ingredient in wallboard, plaster, cement, even blackboard chalk. He was a major stockholder in the Chicago-based U.S. Gypsum Company, and he served as its chairman. Like so many Midwestern businessmen, English moved his family to Beverly Hills after his retirement. Not just any large home or estate, however, would meet his exacting standards. In December 1926, he purchased an impressive eleven-acre parcel between Foothill Road and Alpine Drive. The property stretched from a full block fronting Sunset Boulevard hundreds of feet into the foothills until it met the southern boundary of the twenty-six-acre Kirk Johnson (formerly Thomas Thorkildsen) estate at the top of Alpine Drive. Very few properties in Beverly Hills had such a grand scale, and Oscar and his wife, Alice, planned a mansion that would do justice to that grandeur. The couple was fond of the English Tudor style, because it conveyed dignity and propriety. It was also a popular style in the fashionable suburban areas north of Chicago where they had lived previously. They hired architect Arthur R. Kelly, who was a leading practitioner of the style. Kelly designed a two-story, slate-roofed mansion with distinctive rough-hewn stone walls, first-floor bay windows, and a picturesque roofline with gables, dormer windows, and tall, stone-clad chimneys. An elaborate wrought-iron gate with various English Tudor motifs opened into the estate from Alpine Drive. Other Beverly Hills mansions were larger and more expensive than the English residence, but the house nonetheless became an instant landmark after its 1930 completion, because it sat back from Sunset Boulevard on a gentle rise behind a vast lawn. Visible from several vantage points, the mansion dominated the streetscape. The Oscar English residence also attracted attention because of its next door neighbor, the Arthur English residence, which was also completed in 1930. The two brothers had built side-by-side mansions on the eleven-acre property— Oscar took the west (Alpine Drive) side of the property, and Arthur constructed his home on the east (Foothill Road) side. Surrounded by family and blessed with wealth and the pleasures of a showplace estate, Oscar and Alice seemingly had everything to live for. Sadly, Alice had suffered from painful and debilitating ill health for years, and she had contemplated suicide many times. Oscar had already had one nervous breakdown from worrying about his wife. In another note, she wrote: “I have never had health, and I will not go on longer as I have for years.” Oscar signed his name below hers. Oscar and Alice English chose the day—October 21, 1935—of their deaths quite carefully. Their daughter, Lucille, and her husband, John Cook, who lived in the mansion with them, were away on vacation. Oscar’s brother Arthur was out of town. Their two servants had the day off. They would not be accidentally discovered. They would not be “rescued.” Oscar and Alice pinned a card on their bedroom door: “Call the police. Do not come in.” They locked the bedroom door, took poison, and lay down on their twin beds. Early the following morning, their butler found the card on their bedroom door and called the police. Because of their precautions, no one had any doubt that this was a double suicide. Too grief-stricken to live in the home where her parents had died, Lucille and her husband put the estate on the market. In 1936, Algernon Kirtley Barbee, a soft-drink executive, purchased the estate, and then sold it the next year to Freeman F. Gosden, who played Amos on the Amos ’n Andy radio show. In 1941, Albert S. Rogell, who directed more than one hundred films from the 1920s to the 1950s, including many westerns and B movies, purchased the property. By the mid-1950s, the large Oscar English estate and the adjacent Arthur English estate were glaring anomalies in a Beverly Hills where buyers wanted sleek, contemporary homes and where great estates were being subdivided into small building lots. The English estate was finally broken up and put on the market. The lawns in front of both mansions down to Sunset Boulevard were sold as six building lots. Arthur English’s sumptuous Spanish-style mansion burned to the ground, and a new house was constructed on its site. Today, the Oscar English mansion and two and a half acres of grounds, including a portion of the once-enormous front lawn, are all that remain of the two brothers’ eleven-acre estate. Arthur English’s architectural tastes differed greatly from those of his brother and sister-in-law. Rather than build another English Tudor residence next to brother Oscar’s home, he hired architect Roland E. Coate to design a large, handsome Spanish Colonial Revival mansion. Because the Foothill Road side of the property was slightly steeper than the Alpine Drive site, the Arthur English mansion also had more dramatic grounds, including extensive terraces and a rocky waterfall with a pond. Oscar and Arthur were not the only English’s with Beverly Hills residences: the family had relocated to the city en masse. A third brother, Paul, built a grand Spanish Colonial Revival mansion, also designed by Coate, on Cove Way, behind the Beverly Hills Hotel and across the street from the home of Burton E. Green, father of Beverly Hills. Wallace Neff was one of the most successful – and longest practicing – architects in Southern California’s premier neighborhoods for many reasons. He could design a mansion in virtually any architectural style: Spanish Colonial Revival, French Norman, English Medieval, and Monterey Colonial. He understood how to give his clients both an impressive residence and a comfortable family home for daily living. He knew how to work with the era’s best landscape architects and design a mansion that complemented its site perfectly, no site was too challenging for his skills. For screenwriter Frances Marion and cowboy star Fred Thomson, he transformed a dramatic – but seemingly unbuildable property on Angelo Drive into the famed estate called Enchanted Hill. At the end of 1924, Neff got a telephone call from film director Fred Niblo, who had just purchased another dramatic Angelo Drive property below Enchanted Hill. It had views that stretched from the Pacific Ocean to downtown Los Angeles, with Holmby Hills and Beverly Hills below. Niblo and his second wife, actress Enid Bennett, were already living in a since-demolished Tudor-style mansion at 805 North Crescent Drive, just a block below Sunset Boulevard and the Beverly Hills Hotel. They had been two of the very first “movie people” to move to Beverly Hills. By 1924, when they contacted Neff, they could easily afford to “move up” - to a grand Angelo Drive mountaintop. In some fortuitous instances, an estate becomes legendary not only for its fine architecture and handsome grounds, but also because it reflects a major turning point in a community’s history, in larger architectural or landscape trends, or in the owners’ goals for these showplace properties. La Collina, which was located in the gently rolling hills above Doheny Road and immediately east of the Doheny Ranch, is one of those skillfully designed estates that represented those turning points. 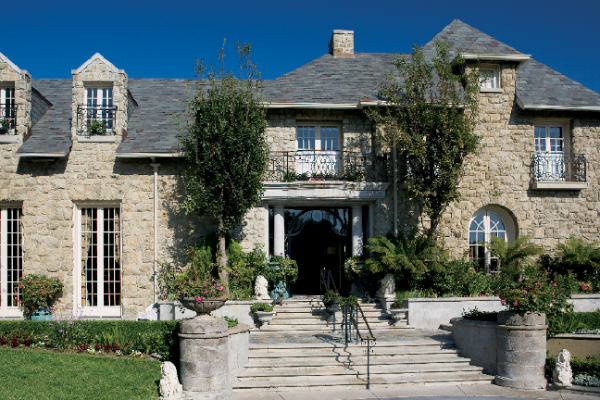 The national architectural press and Los Angeles media applauded La Collina upon its 1924 completion. Flattering articles praised its owner, banker Benjamin R. Meyer, young architect Gordon B. Kaufmann, and landscape architect Paul G. Thiene for their vision. In 1923, 1924, and 1925, La Collina was one of the first major Beverly Hills estates to be designed by a highly skilled architect, not just an architect with the right connections. Virginia Robinson’s father, Nathaniel Dryden, had designed their Elden Way estate. Max Parker, the art director for many Douglas Fairbanks Sr. films, was architect for Pickfair. Many of the early, grand estates had relied upon the design services of the capable but often-uninspired Beverly Hills Nursery to lie out their grounds, as well as provide trees and shrubs. La Collina was one of the first Beverly Hills estates to have a professional landscape architect, who maximized the opportunities presented by the site, and who worked in tandem with the architect to make the property enhance the mansion, and vice versa. Finally, and of critical importance, La Collina was meant to be a very California residence in its location’s climate, terrain, and character. It was not a mock Tudor mansion surrounded by palm trees, nor was it a red-brick Colonial Revival residence that really belonged back East. It was instead, on a sunny hillside overlooking the distant Pacific. The style was Italian, which fit the Mediterranean climate and topography of Southern California. Of course, praiseworthy articles about La Collina were very flattering for architect Kaufmann and landscape architect Thiene. But the real test of La Collina’s impact on Los Angeles estates was the reaction of the city’s millionaires, who would build legendary residences in the booming 1920s, and who would determine if La Collina’s trend-setting styles and principles were widespread practices, or simply an interesting one-time experiment. Among this moneyed crowd, which often placed status ahead of aesthetics, La Collina received a resounding yes. Meyer’s banker colleagues hired the Kaufmann and Thiene team. Even greater approval—from the very peak of the Los Angeles financial pyramid—was soon forthcoming. In the residential neighborhoods of Beverly Hills, change is the one constant. Houses—regardless of their architectural pedigree or historical value—are frequently remodeled, enlarged, or demolished. The grand showplaces of earlier eras are routinely razed and replaced by newer and ever-grander showplaces. On some of Beverly Hills’ oldest streets, three different houses have stood on some lots in fewer than one hundred years. One of Beverly Hills' few great 1920s residences to remain in near original condition is on the north side of Sunset Boulevard, the former Christie Brothers/Richard Barthelmess estate. Here, a grand Tudor-style mansion stands hundreds of feet back from Sunset Boulevard on a gently sloping grassy lawn at the northwest corner of Hillcrest Road. The Christie brothers—Al and Charles—were authentic Hollywood pioneers. In 1909, Al Christie entered filmmaking, working for David Horsley’s Centaur Film Company in Bayonne, New Jersey. Two years later, lured by Southern California’s year-round sunny weather, Horsley and his company members, including Al Christie, moved to Los Angeles. As general manager of the Nestor Film Company, Al oversaw the construction of the first film studio in Hollywood, on the site of a former tavern at Sunset Boulevard and Gower Street. In 1915, Charles Christie joined his brother in Hollywood. A year later, they launched the Christie Film Company, which specialized in short comedies. Scripts were minimal. Sets were rudimentary. Most of the action and the gags were improvised. The earliest Christie films were “one-reelers,” their colleague Pat Dowling recalled years later, “which, meant they had to be 1000 feet of film, no more and certainly no less, or the exhibitors would scream.” Each week, the fledgling Christie Film Company would start filming an “eastern picture”—that meant a society costume drama. When that one-reeler was complete, the actors and actresses changed costumes and made a one-reeler “western” by the end of that same week. Whatever their artistic merits, these shorts were a resounding hit with audiences. The Christie Film Company started churning out comedies. Over the next decade, Al Christie was the producer, writer and/or director of more than two hundred films, while brother Charles ran their ever-gowing studio’s day-to-day operations and supervised their real estate investments. By 1923, Al and Charles Christie, then living on North Maple Drive in Beverly Hills, “traded up” in real estate parlance. In August that year, they purchased from the Rodeo Land & Water Company the four-acre lot suitable for an estate at the northwest corner of Sunset Boulevard and Hillcrest Road. According to the purchase terms, no more than two residences and “customary out-buildings, including a private stable or private garage” could be constructed, and each had to be valued at no less than the then-princely sum of $30,000 each. The deed also included the standard racial restrictions of the time. Rodeo Land & Water Company president Burton E. Green—who was living half a dozen blocks away on Lexington Road—probably wasn’t thrilled at the prospect of nouveaux riche movie people becoming his Beverly Hills neighbors, particularly ones who’d gotten rich on farcical one-reelers that particularly appealed to working- and middle-class big-city (read: immigrant) audiences. Nonetheless, Green sold the land to Al and Charles Christie. Rodeo Land & Water Company had just opened up Sunset Boulevard east of Alpine Drive to development, so it had land to sell. The Christies certainly had the money Rodeo Land & Water Company put restrictions on the size and quality of the house that could be built on the site. Green need not have worried that the Christie mansion would detract from its Sunset Boulevard setting. The two brothers soared way past the $30,000 per house minimum cost limit. Their budget was $150,000. Immediately after the 1923 land sale, workers set about grading the site and landscaping the grounds. By late 1925, “actual building operations” had commenced on the mansion, which was designed by Leland F. Fuller. “The plans call for a house of the English manor type of two stories with an exterior brick, stone and half-timbering, containing a large living room, reception room, library, dining room, private office, and two-story entry hall,” reported the Los Angeles Times. The second floor included “accommodations for seven master bedrooms and baths with sitting rooms and a guest’s gallery,” said the newspaper. The five acre grounds included a clubhouse, swimming pool, and a luxury dog kennel so large that it required a building permit from the City of Beverly Hills. Waverly—as it was called—was completed in early 1926. Its first address was 501 Sunset Boulevard, under the original house-numbering system in use in Beverly Hills for the east-to-west streets. That numbering system was discarded in the late 1930s, and major streets like Sunset and Santa Monica Boulevards were given new numbers that conformed to the county-wide system. East-to-west streets that ran in Beverly Hills only, like Lexington Road, kept their original numbers. The Waverly mansion totaled just over 12,000 square feet—which was a big house even by Beverly Hills standards. But it had to be large, and not just to make a statement to the world about the Christie brothers’ success. Waverly was a family compound whose residents included Al and his wife, Shirley; Charles, who never married; their sister, Anne; and their mother, Mary. Christie comedies and the Christie brothers were a smashing success in the 1920s. They released dozens of films, including some of the first talkies. “Christie Comedy Output Will Be [Sound] Synchronized,” announced the Los Angeles Times on June 26, 1928. The brothers invested heavily in Los Angeles’1920s real estate boom, and they built Hollywood’s first luxury hotel, known as The Regent, on Hollywood Boulevard. Little could upset the Christie brothers’ success. In July 1928, actress Alys Murrell filed three lawsuits against Charles: one for breach of promise to wed, for a breathtaking $1 million in damages; a seduction suit, for $750,000; and a breach-of-contract lawsuit regarding a film role, for $97,500. Or a grand total of $1,847,500, according to the cleverly headlined July 29, 1928, Los Angeles Times article, “Actress Sues for Love Balm.” Charles’ attorney proclaimed the assault “just plain blackmail,” and the lawsuits were settled out of court the following month. “The attorneys refused to divulge the figures of the settlement,” noted the Los Angeles Times, primly this time. But far worse was yet to come. The 1929 stock market crash, followed by the Great Depression and the collapse of the Los Angeles real estate market, wiped out the two men. In 1932, the Christie brothers lost their studio. The following year, they sold their Waverly estate to actor Richard Barthelmess, who purchased the mansion so that he could live next door to his long-time friend William Powell on Hillcrest Road. Throughout all the mayhem of the Karl-McDonald marriage—he purchased the house after their second marriage in 1954—Waverly escaped unscathed. Subsequent owners, including talent agent Arthur Lyons who represented Jack Benny, Joan Crawford, and Lucille Ball, among others, respected the mansion’s Tudor style. Neither did the owners sell off any portion of the sweeping five-acre grounds, which had happened with so many other nearby estates after World War II. At one time, Waverly was easily visible from Sunset Boulevard. Today, however, this estate is hidden from view behind a tall hedge: a verdant Eden that evokes memories of 1920s Beverly Hills and the heyday of the Christie brothers in the silent-film era. Among all the showplace homes in Beverly Hills, this Foothill Road estate is by far, one of a kind. The sprawling Spanish-Moorish residence is the only pre-World War II mansion on an estate-sized lot in the Beverly Hills flats. To many residents, it’s the north-of-Sunset property that got lost and ended up south of Sunset in the flats. The mansion also acquired an air of mystery among its immediate neighbors, for reasons that involved more than its larger-than-life size and exotic architecture: the lack of activity – particularly the lack of parties – for an establishment of its grandeur. Real events – and occasional reports from its servants to the neighbors – proved that it was never your everyday Beverly Hills mansion. Ruth Clifford was one of the brightest silent-movie stars, and at fifteen moved to California to live with an aunt. Immediately she became entranced by the new business of silent pictures. She was a pretty, petite, blue-eyed blond with a certain way about her, and the pictures – likewise became entranced with her. She was an extra for Edison’s local film company until she was spotted by a director at Carl Laemmle’s Universal Studios and immediately signed. Upon their February 1925 return to California, James Cornelius and Ruth Clifford moved into their new Foothill Road home. It was a startling sight in the fashionable Beverly Hills flats. The mansion was much larger than its neighbors and more shocking – it occupied a one-acre double lot. It was one of the few estate-sized properties south of Sunset Boulevard. The Cornelius-Clifford mansion was an imposing presence in the neighborhood. The thick stucco walls, wrought-iron balconies, beautiful cast-stone embellishments surrounding the windows and atop the massive chimneys, as well as the façade’s centerpiece- a soaring trifoliate window – all gave the mansion the improbable air of a land-locked Venetian palazzo. Inside, the large, low-ceilinged rooms had only a few windows, which not only reflected the Spanish sensibility popular at the time but also served the practical purposes of keeping the living areas cool in the summer and protecting furnishing from exposure to the sunlight. A new family purchased the home in the 1950s, but it remains in their family today, a splendidly preserved reminder of the splendor of 1920s Beverly Hills. The Robinsons crossed unpaved Sunset Boulevard, then Lexington Road, and found a short street off North Crescent Drive called Elden Way. Elden Way ended at a barren promontory overlooking Los Angeles to the east and the Pacific Ocean to the west. The truth, however, was a bit different. The Robinsons’ purchase of this large lot, and their subsequent purchases of adjacent parcels in the virtually empty new community, was hardly impulsive and made perfectly good sense. The couple, of course knew about Beverly Hills, as they were members of the Los Angeles Country Club, which opened its new facility in late 1911. Beverly Hills had been heavily advertised in newspapers and magazines after its October 22, 1906, grand opening. Most importantly, Virginia’s uncle, Leslie C. Brand, often invested in real estate deals with multimillionaire Henry E. Huntington, who was one of the original investors in the Rodeo Land & Water Company that developed Beverly Hills on the former Hammel & Denker Ranch. Through, Brand, the Robinsons would likely have known that the heavily capitalized Rodeo Land & Water Company was going to make good on all its development promises for Beverly Hills. Most likely, they also knew that the plans for the luxurious new Beverly Hills Hotel, financed by Huntington, were to be announced in April 1911. The twelve-room house was only one story tall – a decision that made for a less-impressive-looking residence, but that permitted most rooms to look out or open directly onto the grounds or the handsome terraces. The front door led into a central hallway that ended at the rear of the house and the entrance to the Great Lawn. Off the central hallway – a living room, dining room, library, morning room, bedroom suite for the Robinsons, a small guest house for Virginia’s mother, and a large kitchen and staff area. The house, while quite large – lacked high ceilings and the extensive neoclassical detailing popular in that era. The woodwork was white cedar, painted with light-color enamel paint, not the mahogany or walnut then favored for large homes. Harry and Virginia – unlike many of their well-to-do Southern California contemporaries –saw no reason to construct a showplace home to trumpet their position. Their lofty social and financial standing was unquestioned; they built for comfort and beauty. With their enthusiasm, the Robinsons started their lifelong transformation of the barren hillside into a garden paradise. The Robinsons officially moved into their new home on September 30, 1911. On the inside cover of one book in the library, Virginia wrote: “September 30, 1911, our first night in our new house.” She had celebrated her thirty-fourth birthday a week before, and little did she know that she would live to be ninety-nine years old, and that she would spend nearly sixty-six of those years at this Elden Way estate, eventually known as the First Lady of Beverly Hills.